Sripathi Panditaradhyula Balasubrahmanyam or fondly know among his fans as S.P. 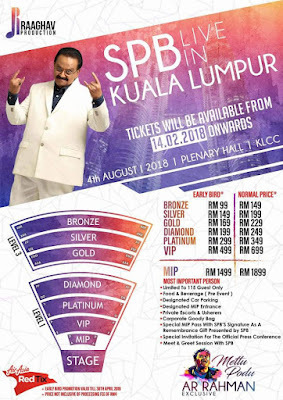 Bala, is set to treat his Malaysian fans into a night of musical galore with the “SPB Live In Kuala Lumpurt Concert”. The grand stage is set on the 4th of August 2018 at Plenary Hall KLCC for this magical music night. Organized by Raaghav Production, the tickets of this event go on sale from 14th February 2018 onwards and you can get them from Air Asia Red Tix site. The early bird promotion price starts from as low as RM 99 up to RM 1499 depending on the seating areas you choose to purchase. To make things even more this concert will be an AR Rahman exclusive song composed only concert. Imagine this, the majestic voice of S.P. Bala together with the magical music of A.R. Rahman brought special for you! This is one not to miss. It is impossible to find an individual who has never loved a S.P. Bala song before. This great man has now been singing for 52 years! It is almost as long as the period Malaysia gained their independence. His debut came in 1966 in a Telugu film and it was only after 3 years he got his breakthrough in the Tamil Industry. His debut Tamil song was “Eyarkai Ennum Illaya Kanni” in a 1969 hit film “Shanthi Nilayam” starred by Gemini Ganesan. Shortly after that S.P. Bala was selected to sing for another Tamil Industry Legend, M.G.R. However, lady luck did not smile much on S.P. Bala’s side. He was diagnosed with thyroid shortly after he was selected to sing for M.G.R for “Aadimai Penn”. He was very down that he wouldn’t be able to sing for the Makkal Thilagam due to it. However, M.G.R. was adamant that it is S.P. Bala who must sing that song and even went to the extent of delaying the shoots to give S.P. Bala enough time to recover and sing for him. This are the stuffs legends are made of! To let you understand what an amazing talent S.P. Bala is, let me tell you about why he is dubbed as the “Song Machine”. S.P Bala is a singer who is well known for his capabilities of recording multiple number of songs in a single day. I am not talking about 4 or 5 songs a day. On February 8th, 1981, S.P Bala recorded a stunning 21 Kannada songs in Bangalore in just 12 hours. He also has recorded 19 Tamil songs in a single day and 16 songs in Hindi. This must be some sort of record. When you are called a “Song Machine” I was not surprised to learn that S.P. Bala holds the Guinness World Record for the highest number of songs, for any playback singer with over 40,000 songs in various Indian languages. That’s right 40,000 over songs! One of my favourtie thing about S.P. Bala is that he has landed his voice numerous times for my favourite actor Rajinikanth. That’s write many of Rajini’s film, the opening songs were usually sung by S.P. Bala and that combination never fails to evoke magic every time. It is a real blessing to see such a talented artist like S.P. Bala is coming over to Malaysia to perform for us all. You could except hits of S.P Bala- A.R Rahman combination songs such as Kaadhal Rojave, Anjali Anajli and En Kaadhale from Duet to be performed for you. I can’t wait for this show on August 4th and I am sure you can’t wait for it too. So, make you get them!